(Foreword by Michael Fullan) highlights techniques to achieving the three key essentials for effective performance as an educational leader. This book will provide leaders with skills and strategies related to Organization, Communication, and Empowerment, three areas that are foundational to effective leadership. The underlying purpose of this book addresses the importance for educational leaders to develop methods for efficiently taking care of the technical aspects of management in order to achieve the time element needed to be the instructional leaders he/she aspires to become. This book provides leaders with tools to ease the complex job of leadership manageable so that productivity is increased and energy sustained.
} especially effective for new principals. 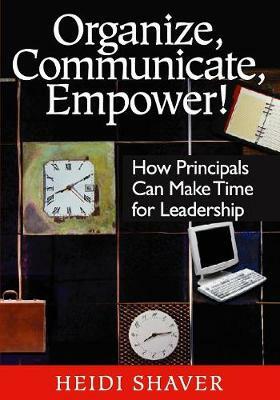 "Shaver has captured the basic elements for success for novice principals and assistant principals. In a friendly, conversant style, she describes many logistical aspects of the job, giving multiple suggestions for ways to make these less of a burden for the school leader."